Just got off the water in Grand Haven this morning! Awesome session. I rode my 8m switchblade which started out a little underpowered, but halfway through the session I was completely lit! The waves were big but pretty predictable with some clean ones mixed in. Not too hard to get out past the shore break. I think as the day goes on it will become harder. Pictures and video to follow soon. Last Week: Nailed it. Another one of those weekends with no wind. 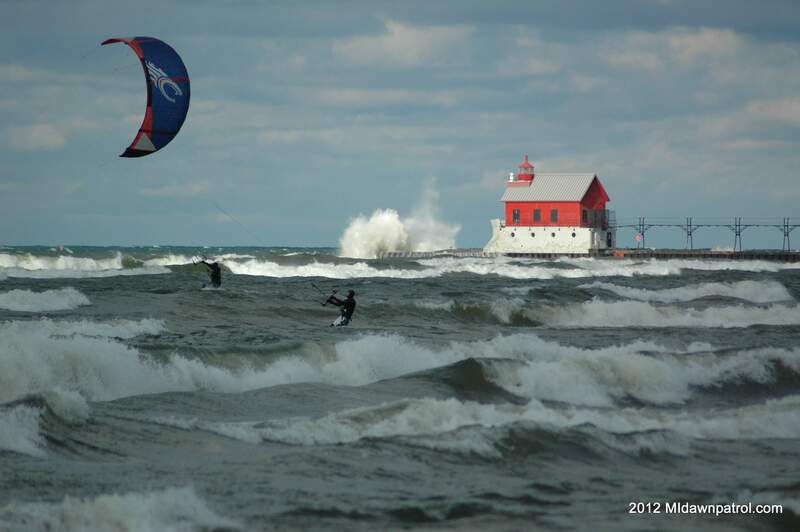 Today: The wind is already blowing 30 knots out of the WNW all along the lakeshore. This will continue throughout the rest of the day and into the night. Most of the rain should be out of the area by early afternoon. Waves will be building all day long into 9 and 10 foot or more. Saturday: The wind will still be blowing hard out of the WNW saturday morning and the waves should be pretty big and closing out fast with lots of current. I hate to say it but it might be difficult conditions. The wind will die down as the day goes on. The strongest winds will be from Muskegon and south. There will also be some rain moving through during the day. Sunday: A decent wind out of the WSW at around 20 knots along the lakeshore. It will be the strongest during the middle of the afternoon. The waves should be smaller by now but probably won’t be very clean. It’s going to be interesting how the rest of today and saturday shape up. I’m hoping it’ll be great conditions, but I also think that it could become just a mess of gnarly waves hammering the shoreline.